US 395 is the main north-south route in California east of the Sierra Nevada range, and for much of its length has very good views of the snow-covered mountains nearby. At the small town of Lee Vining, close to the junction with CA 120 (the Tioga Road, leading to Yosemite National Park) lies Mono Lake, a large, shallow, alkaline lake that is impressive enough from a distance but close up has added interest in the form of unusual tufa (calcium carbonate) pinnacles, deposited over thousands of years around underwater springs and now left exposed because the lake level has fallen in recent times. 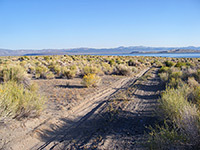 The land surrounding the lake (Mono Basin) is generally level, uninhabited and quite barren though it contains many ancient volcanic remains in the form of lava fields, craters, rhyolite domes and cinder cones; most accessible is Panum Crater, 2 miles south of the lake. Another is Black Point by the northwest corner - a flat-topped, rounded hill composed mostly of ash, the top of which is split by several colorful, slot canyon-like fissures up to 80 feet deep and just a few feet wide. 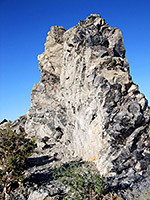 All these features are associated with the Long Valley Caldera, a still-active zone of volcanism that extends 50 miles south towards Bishop and contains the dynamic thermal features of Hot Creek. 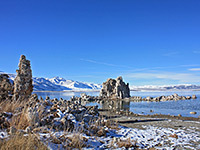 The most spectacular approach to Mono Lake is from the north, where US 395 circles around the top of a ridge (Conway Summit) at 8,200 feet, from which a great vista stretches for a long way south, including the deep blue lake surrounded by stark white rocks, 1,800 feet below and 5 miles distant. 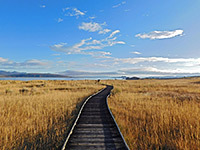 The highway follows close to the west shore and has several access points, while unpaved roads lead to places along the south edge, though most of the shoreline is out of reach. Other good vantage points are found along the Tioga Pass Road, where the lake can be viewed from up to 3,000 feet above - and from even higher along some of the trails in Yosemite National Park, for example to 10,604 foot Mono Pass. Mono Lake is a remnant of a much larger body of water that covered much of the surrounding region after melting of glaciers 750,000 years ago. Like many similar lakes of the Great Basin Desert in Nevada, there is no outlet so the water can only leave naturally by evaporation, and hence the water has a high salt content - three times that of the sea. The lake level fell steadily after 1941 due to water removal from its tributary streams to supply cities in Southern California, principally Los Angeles, although this practice ceased following a protection order issued in 1994. The surface elevation is now gradually rising. The lake is not generally suitable for swimming or paddling as the water is somewhat smelly, sub-surface rocks are sharp and in summer at least there are vast swarms of tiny black alkali flies living close to the shore, often making the land appear quite dark. These are curious in that they will not settle on people - one can walk along disturbing great clouds of them yet remain untouched. There are no fish in Mono Lake, and the only creature that can survive in the alkaline water is the brine shrimp; these, and the whole lake, are now protected as the Mono Lake Tufa State Reserve. Besides the tufa formations, this helps to safeguard the large and varied population of birds that nest in the area - over 300 species have been spotted here, the most numerous being the western sandpiper, California gull, eared grebe, Wilson's phalarope and red-necked phalarope. 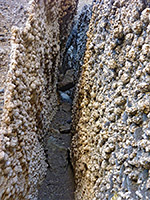 The easiest place to see tufa, or the alkali flies, is the Old Marina site along Highway 395, accessed by a short side road then a trail to the shore. 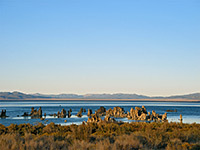 The place is quite popular though the formations are not as impressive as those at South Tufa, reached by driving 4.8 miles northeast along Route 120 then 1 mile north on an unpaved track, ending at a carpark with information notices and the start of a boardwalk trail to the water's edge. This too is popular, especially at sunrise and sunset when the eerie formations are at their most photogenic. The tufa towers cover quite a small area but the far-reaching views in all directions provide an endless variety of scenes. A second, smaller group of pinnacles are found a short distance off trail to the west, while another track leads further east to Navy Beach (see panorama), once used by the military, and now a potential place for free camping - overnight stays are allowed along rougher tracks branching off the access road. 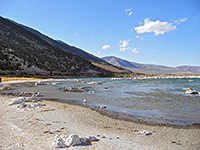 The open, grassy hills around this part of the shore and the woods of the nearby Inyo National Forest have many peaceful, scenic sites to spend the night; the closest places to US 395 are along Test Station Road, which has several flat, open areas at the edge of a hill with views over the lake. 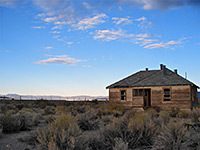 The road is paved for a while then gravel as it descends towards the water, passing a picturesque abandoned house then heading east and giving alternative access to the South Tufa area. The stark land around this part of the shore formed the setting for Clint Eastwood's 1973 film High Plains Drifter, a project that required construction of a replica Western town ('Lago') right on the shore, about 2/3 mile west of the South Tufa formations. A faint track leads to the movie site, though no trace of the town remains today. There are several official campgrounds near Lee Vining, and a few basic motels; the next nearest town with hotels is Mammoth Lakes (27 miles south).